Tim Jakins has farmed in the West Country all his life, and took over the National Trust tenancy at New Barton Farm, Wembury in 1997. The farm is a 200ha mixed farm sited along the beautiful Devon coastline at Wembury, featuring a mosaic of habitats which supports a rich diversity of wildlife. Tim runs a herd of 100 Red Ruby suckler cows, 250 North Country Mule ewes with 161 ha of arable, fattening their own livestock. 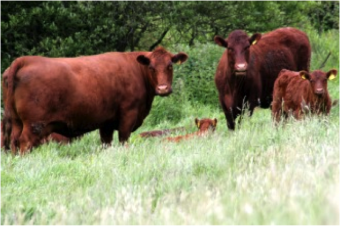 Tim chooses Red Ruby cattle because they provide good quality meat as well as being good grazing animals, particularly on steep valley slopes, and capable of coping with extreme weather conditions. Since 1998, the farm has been supported through agri-environment schemes. Despite mixed feelings about the administration of the schemes, Tim would still recommend them to all farmers to ensure local producers and sustainable farming is fully supported. Disillusioned with sending cattle to large abattoirs and never receiving feedback, the lack of a local butcher, along with the realisation of a growing local demand for meat, Tim and his wife Charlotte decided to employ a butcher, Wayne, and embark on opening their own farm shop `Moostone Meats‘ at New Barton in 2005, and have not looked back since. 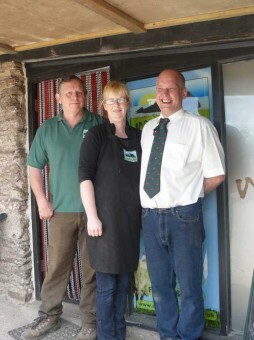 “Ten years ago, we would never have envisaged us opening a shop and diversifying into other non farming activities, it is hard work but we pride ourselves on providing good quality local meat”. All the lamb and beef sold through the shop is born and raised at New Barton Farm, sent to a local abattoir and then hung and processed back at the shop by Wayne, reducing food miles and ultimately any stress on the animals. Moostone Meats has won Taste of the West awards, and recently featured on national TV, with ‘Countrywise Kitchens’ focussing on their Red Ruby beef. Tim has noticed the wildlife increase across the farm. 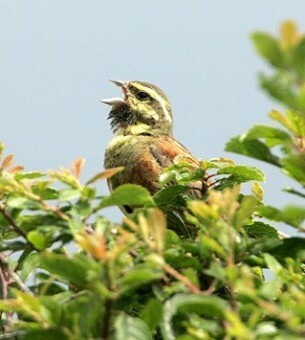 Cirl buntings have certainly responded to his low input grass management & spring sown barley. From just one pair recorded in 2003, to 5 males at the last count seen on the farm in 2008. Arable plants such as field madder, common fu- mitory and common poppy flower are also found on the farm. During the summer Dartmoor ponies graze the species rich coastal grassland, Tim then brings in hardier hill ewes from Dartmoor for some winter grazing. Choughs have also been recorded along this coastal stretch, Tim hopes that with his management along the coast they may be encouraged to stay.